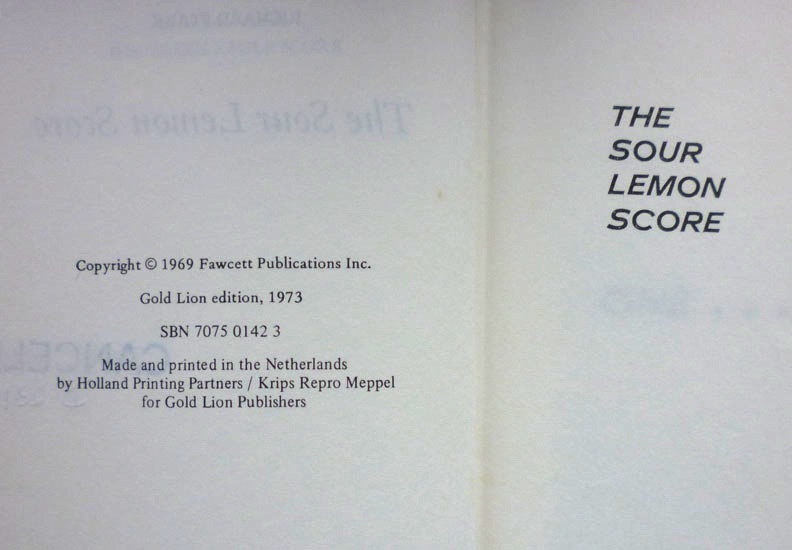 Published by Gold Lion in the UK in 1973, this is the first hardback edition of the twelfth Parker novel, The Sour Lemon Score, originally published in paperback in 1969 by Gold Medal (no relation) in the US and Coronet in the UK. 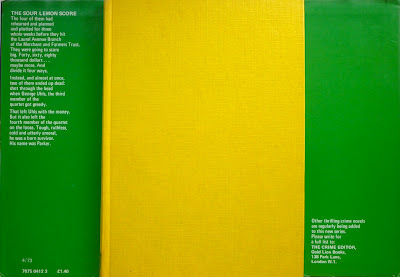 As I explained in that 2011 post – the cover images for which I borrowed from a friend of famed book dealer Jamie Sturgeon – for the most part, the initial twelve Parker novels, all of which were first published as paperback originals, didn't make it into hardback until the 1980s, when Allison & Busby in the UK picked up the rights (Parkers #13–16, i.e. Deadly Edge to Butcher's Moon, were published straight to hardcover by Random House in the States, and all of the Parkers from the second run – Comeback, Parker #17, onwards – were also published initially in hardcover). 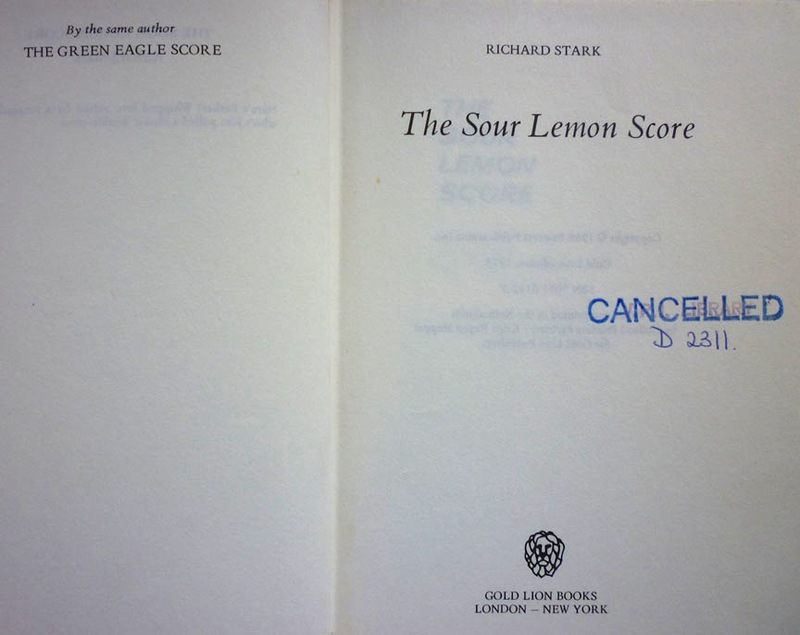 There were, however, three exceptions: The Split (alias The Seventh), The Green Eagle Score and The Sour Lemon Score, all of which Gold Lion issued in 1973 as hardcovers. 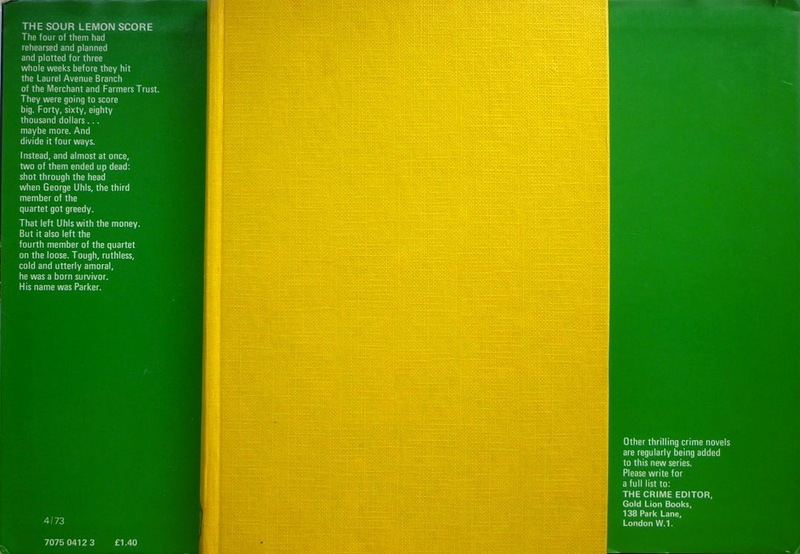 All three are very scarce and consequently highly sought-after by collectors, especially the latter two, which boast not-bad-at-all illustrated dust jackets (The Split has a photographic jacket). 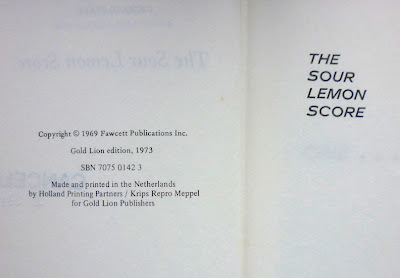 And to my mind The Sour Lemon Score is the best of the lot – which is why I got quite excited when Jamie Sturgeon dropped me a line to tell me he'd found a copy (in Australia, no less), and would bring it along to the Paperback & Pulp Bookfair for me. This being Jamie, his asking price was disgustingly reasonable (the cheapest copy available online at present is listed at £100, and Jamie wanted a hell of a lot less than that), even given that it's ex-library copy, although the only evidence of that is a few stamps; otherwise it's in pretty good nick. 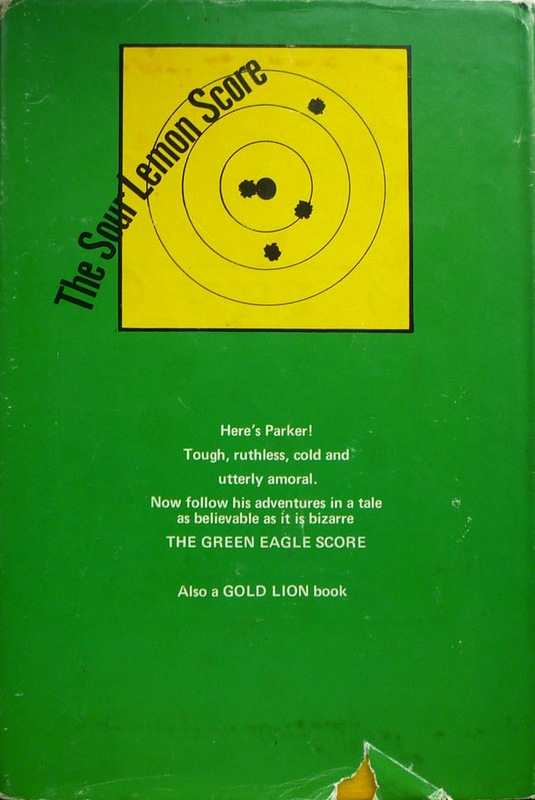 The Sour Lemon Score is widely – and rightly – regarded as one of the greatest Parker novels, but for me the interesting thing about it is that it's one half of one of those curious miniseries-within-a-series Parker pairs, like Slayground and Butcher's Moon, or, from the second run of Parkers, Nobody Runs Forever and Dirty Money. 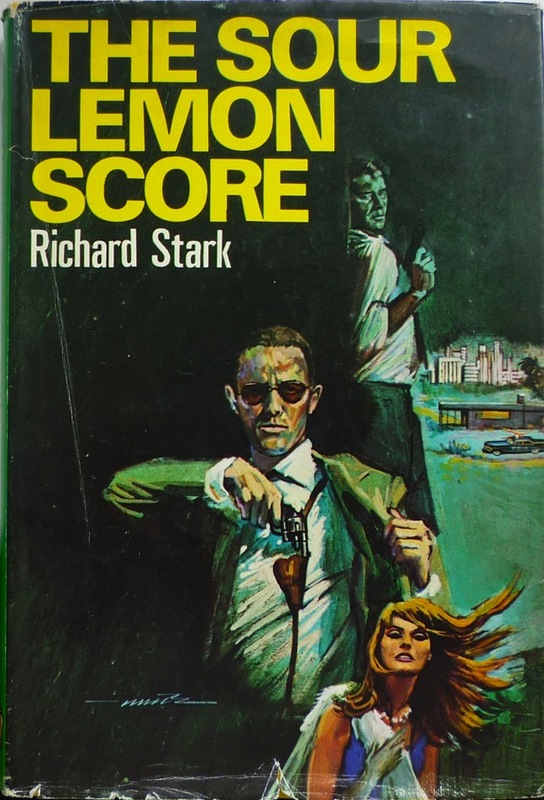 There are threads left dangling at the end of The Sour Lemon Score that aren't resolved until the next-Parker-but-one, Plunder Squad; it's an odd, notable characteristic of the Parker series that Westlake/Stark would occasionally pen these direct sequels, and yet write a largely unrelated instalment in-between: Deadly Edge sandwiched between The Sour Lemon Score and Plunder Squad; Plunder Squad nestling between Slayground and Butcher's Moon. I guess it's all part of the intertextual (and metatextual) games Westlake liked to play, not only within his own novels but also with his friends'; witness the crossover between Plunder Squad and Joe Gores's Dead Skip, for instance. In any case, I'm a big, big fan of Plunder Squad – it's one of my personal favourites of the Parkers – so it's nice to own both the first hardback edition of that and now of The Sour Lemon Score as well. Decent cover art, but somehow it just doesn't jibe with my mental imagery from that book--the guy drawing his gun (Parker? Is Parker the other guy?) is too smug-looking and well-groomed. He looks like Michael Weston from "Burn Notice", and that is most decidedly not a good thing in this context. 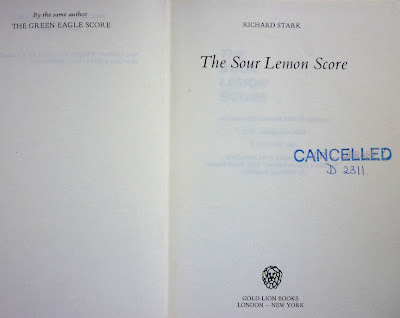 I love "The Sour Lemon Score", but again I am moved to wonder why it's such a fan favorite. Parker doesn't (successfully) steal anything in it, doesn't kill anybody in it (he shows seemingly atypical mercy to people who don't remotely deserve it, not once, but twice), doesn't bed anybody in it. It is an exercise in patience and frustration for the heister the direct antithesis of "The Hunter"--Westlake had him strike out over and over in this period of the series, leading up to the nigh-orgasmic finale that was Butcher's Moon. And it works. But why does it work? Is there a part of us that wants to see Parker thwarted sometimes? After all, if we wanted to see a truly invincible protagonist, who always gets exactly what he's after, we wouldn't be reading these books, would we? Maybe the point is that successful or not, he never seems to get discouraged. He just melts back into the underbrush, and waits his chance to try again. Failure is an inevitable part of life, and it's how you deal with it that matters.